Resolution Impala Saracens went top of the Kenya Cup log after match day one courtesy of a 48-0 shut out of visiting Regional Logistics CFS Mombasa at the Impala Club on Saturday 25 November 2017. The hosts went ahead when Edgar Obino scored the opening try, Xavier Kipng’etich converting for a 7-0 lead. 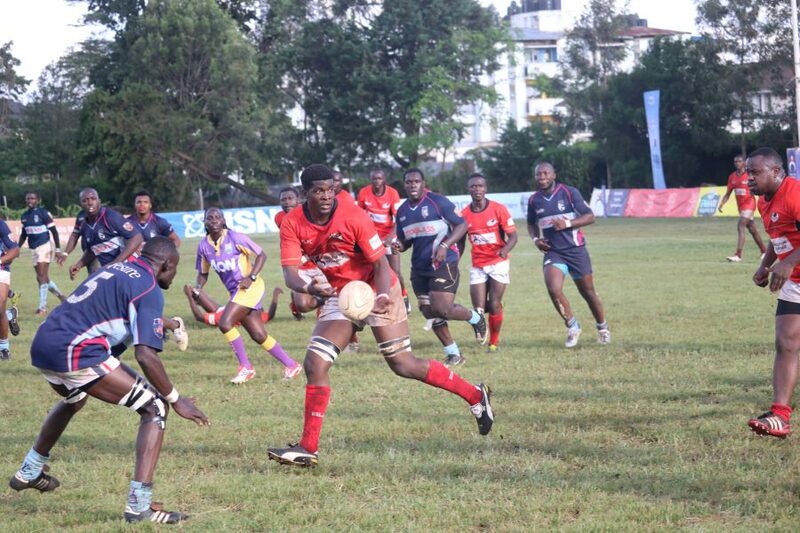 Resolution Impala Saracens Tyson Okoth in action against Regional Logistics CFS Mombasa. The Sarries won this match played at the Impala club on Saturday 25 November by a 48-0 margin. Mombasa were on the receiving end but holding out with resolve, eventually cracking under immense pressure. Timothy Makiya would landed the hosts second try before Mike Gitau,on debut after his off season move from the Strathmore Leos barged over, Kipng’etich converting to see the hosts go 19-0 up at the interval. Two unconverted tries from George Okowa and Makiya put the hosts 29-0 up before Mark Kwemoi converted Sammy Motari’s try for a 36-0 scoreline. Kwemoi then converted Anthony Nyandigisi’s try before adding his own five pointer to see Impala close out the result, and with it pole position on the log after match day one.